You are in Home > Our Installations > Electricity Bills? Our customers approached us to assist with reducing both their electricity cost AND to try to minimise their impact on the grid as far as possible. Their cottage is old and stone built. Due to the location and size, the roofs were not particularly suitable due to shading from the landscape and trees. 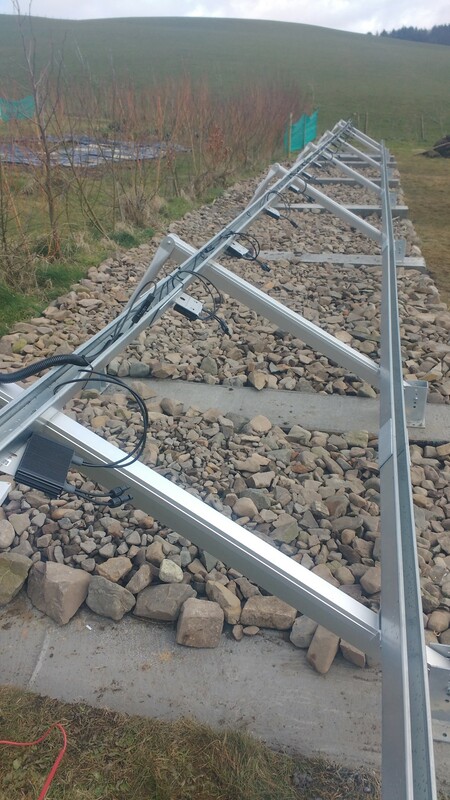 A ground mounted system in a much less shaded area was chosen, and despite the cable run required it was deemed that the increased generation would prove worth the cable and ground works cost. 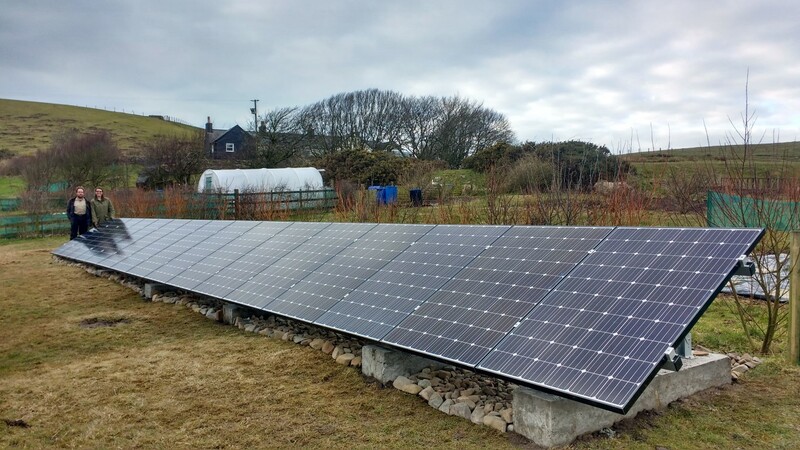 We recommended getting the largest system practical, in this case 16 modules mounted in a singe row, using the SolarEdge inverter system for its various benefits, not least possibility to run many modules per string. Whilst the home’s electricity consumption is fairly small the large system will ensure good generation even through the winter months. In order to make best use of the genration when it’s available year round, using it when it’s required in the home, the Tesla Powerwall 2 was selected to provide battery storage to the system. The energy capacity and power from the Powerwall will serve to reduce the home’s consumption from the grid substantially. Along with quotations for the works, we provided all technical details of the installation. This system will significantly reduce the requirement for imported electricity. Due to the size of the system even in low light there will be sufficient power generated to cover base loads for almost all daylight hours and most of the load outside daylight due to the battery’s power and capacity. The system over the course of a year will generate in the region of 4,150kWh. The home’s low consumption should be covered by this, depending on the generation and load profiles. In the first months of the system’s operation, it was found that there was plenty of spare generation after the battery became full. This was then diverted to some very welcome heating loads, saving having to light stoves for the shoulder months of the year for space and water heating. 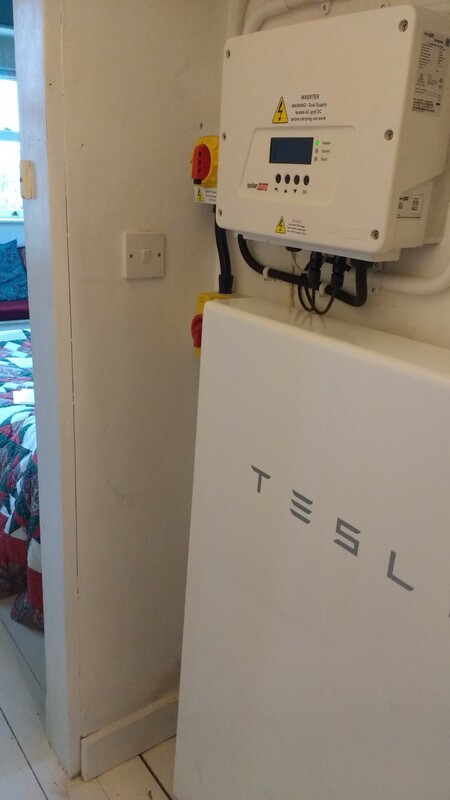 We provided complete support and installation for the whole solar PV and Tesla Powerwall 2 system. After a few months of operation, the site has used virtually no electricity from the grid. Only the electric shower, whose power is above the total system power (7.36kW) imports from the grid. The battery has remained with energy since 6th March 2018 until writing (21st June 2018 and counting! ).